50mm module utilising the HDMI-ST™ board with a front panel HDMI socket terminated internally onto screw terminals the repair of cables. Supplied with connection instructions showing typical cable colour codes and screwdriver. 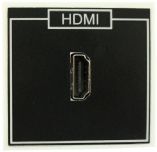 50mm module utilising the HDMI BB™ board with front and rear panel HDMI sockets. For use with pre-made HDMI cables. 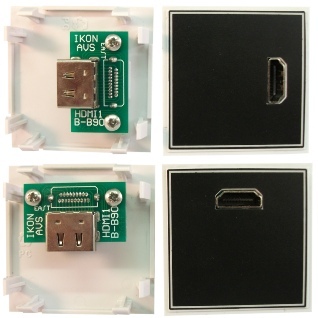 50mm module utilising the HDMI 90™ board with a front panel HDMI socket linked to a 90deg HDMI socket internally. For use with pre-made HDMI cables. 50mm modules fitted with 4 different adapters. Can be fitted into 1 or 2 gang frames to make a useful wall plate. 50mm module fitted with a 160mm female to female fly-lead. 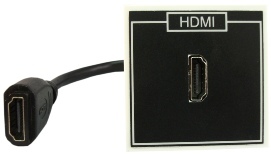 The fly-lead HDMI coupler makes fitting pre-made cables easier. 50mm module utilising the HDMI 90™ board with a front panel HDMI socket linked to a 90deg HDMI socket internally. The module can be fitted either vertically or horizontally into a face plate or desk module. The HDMI connector is offset to make fitting pre-made cables easier.